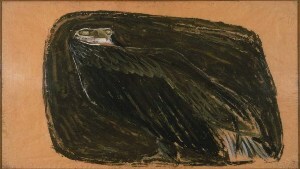 Morris Graves, Eagle, c.1942. Gouache on paper, 21 x 36 in. The Phillips Collection, Washington, D.C. Acquired 1942. As this week is the first of my internship at the Phillips, I felt that it would be in my best interest to familiarize myself with the galleries, the collection, and the many ways to come and go throughout the museum. While strolling through the museum, I quickly discovered how easy it is to become captivated by a particular work of art, artist, collection, or all of the above at once–there is something new and intriguing at every turn. The museum goes one step further by offering brief discussions with gallery educators around a specific artist or artwork, encouraging visitors to discover a deeper, “behind-the-scenes” understanding of the objects on display. I stumbled upon one of these weekday noon Spotlight Talks led by Volunteer Coordinator Lisa Leinberger on the work of Morris Graves, an American expressionist painter whose work conveys nature from a different point of view. Leinberger explained that Graves intended to portray great emotion in his work, detailing nature’s struggles and triumphs through his manipulation of light and dark. Specifically, we looked at several of Graves’s paintings of birds, most of which appear to be sad or injured. In Eagle (c. 1942), a bird that holds much symbolism and majesty for Americans is painted dark and hunched over, hardly the national emblem we’ve grown to recognize. Graves’s paintings of birds might not be the happiest, but they certainly portray the artist’s understanding of these animals’ struggles, suggesting that he felt at one with nature as he created them. This entry was posted in Experiment Station and tagged Morris Graves, Spotlight Talks. Bookmark the permalink.